It was my pleasure and privilege to meet the Sussex artist Veronica Burleigh some sixteen years ago through my friend, the artist Harry Shaw. At that time Veronica was living in the poetic village of Blackstone, near Henfield. Her brick cottage was furnished with Georgian vernacular furniture, which lent a soft charm to this gentle home. The walls were hung with paintings by herself, her father, Charles, and her mother, Averil. At the bottom of the garden was her studio, where work from this trio of family artists vied for space and attention. By the time I met Veronica, her eyesight was sadly already failing, but she still took a keen interest in the world around her. The Burleighs became a celebrated family of artists. They lived and worked for most of their lives in the Brighton and Hove area of Sussex. Their artistic styles represent many of those prevalent during the early years of the 20th century. Each studied at the Brighton School of Art and it was here that Charles met Averil. They were married in 1905 and had Veronica in 1909. 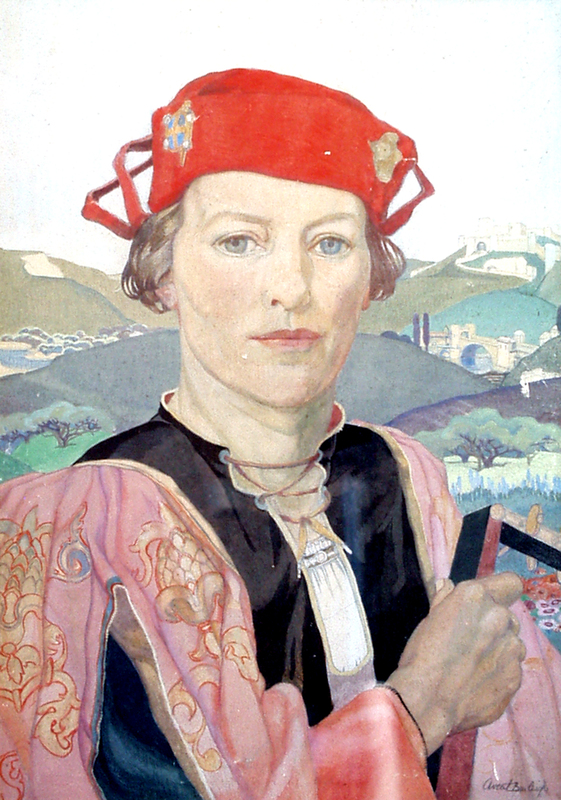 In 1926 Veronica graduated from Brighton to the Slade School of Art and the Royal Academy. Charles Burleigh’s work has an academic quality. Take, for example, this charming scene titled ‘The Pond’. 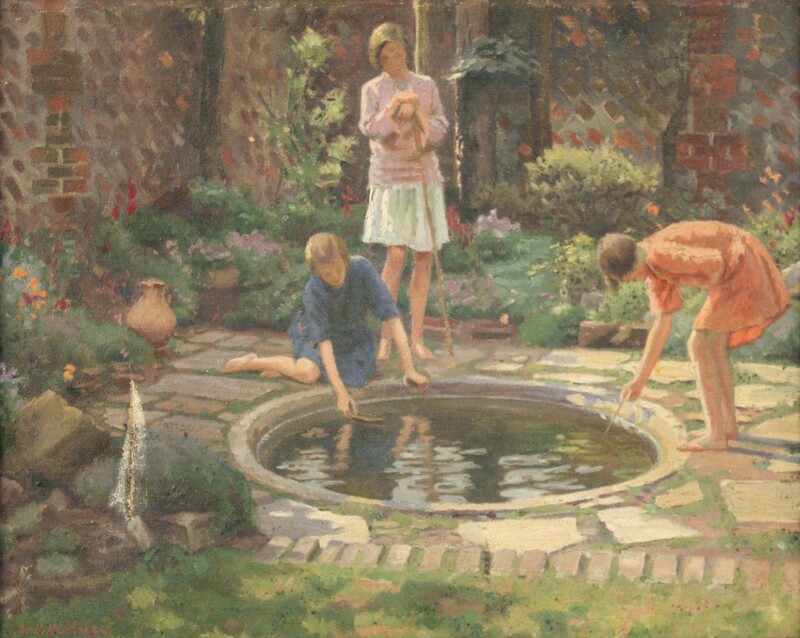 Here three girls are absorbed in fishing, framed by the summer border of flowers in a walled garden. The Burleighs were a close family and Charles often painted his daughter, so perhaps one of these girls is Veronica. Averil’s work differed from her husband’s. She perfected a graphic style, which was both imaginative and decorative. From the 1920s her work became predominantly figurative, with a stylistic simplification and restraint. Evoking the art of the early Renaissance, she employed the medium of egg tempera, an ancient method whereby a colour pigment is mixed with egg yolk, rather than oil. The striking study ‘Troubadour’ illustrates Averil’s precise, graphic style and the influence of Renaissance art in the painting’s composition and landscape. Veronica’s work also reflects a talent for precise draughtsmanship and colour. 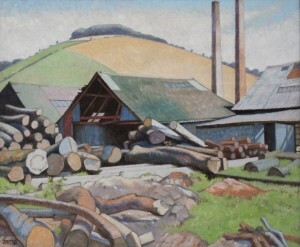 Take the oil painting ‘Sawmill under Goodwood’. 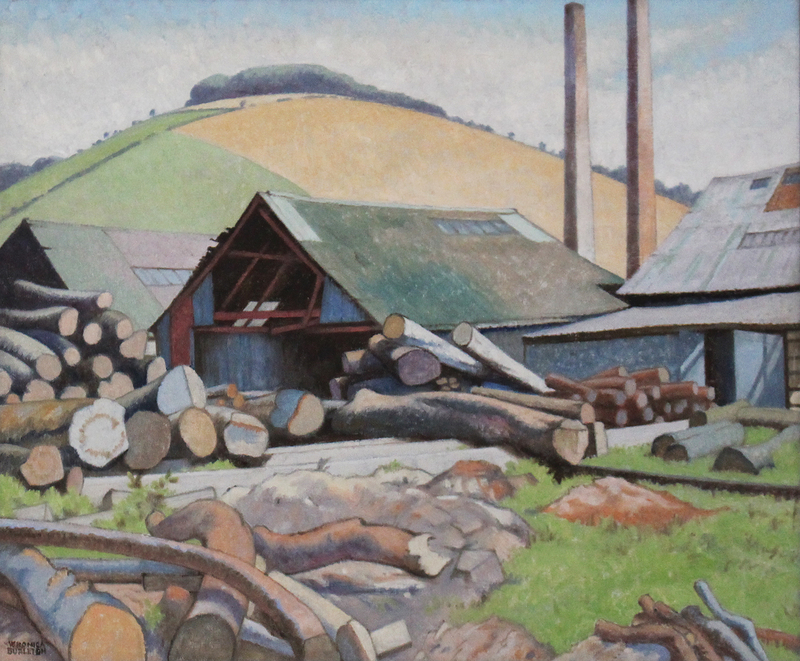 Here the stylized composition of logs draws the eye to the dramatic red beams of the mill shed and beyond to the downland crest with its crown of trees. In 1952, three years after Averil’s death, Hove Museum & Art Gallery held an exhibition of pictures by all three artists and commentators were quick to remark on the common threads in their work. At auction, paintings by these artists range between £50 and £1200. Examples of their work can be seen at Brighton and Hove Museums, Worthing Museum & Art Gallery and in other city art galleries across the country. By Revd. Rupert Toovey. Originally published on 29th October 2014 in the West Sussex Gazette. This Saturday, 25th October 2014, the Chichester Lions will once again be at Chichester High School for Boys, Kingsham Road, Chichester for their 20th Annual Model Miniature Railway Exhibition. An event which provides fun for families and railway enthusiasts alike. Tinplate toy trains like those made by Bing and other German makers were exclusive and expensive in the early 20th Century. Frank Hornby was behind the move to manufacture model railways for the masses. He had invented Meccano in 1901 but it was not until after the Great War that he went on to make model trains. Almost a century later Hornby trains still have the ability to capture the imagination of the enthusiast, both young and old. Frank Hornby developed a new product in the form of the O gauge train set. It was intended to rival the tinplate toys of Germany and from 1920 they carried their inventor’s name – Hornby. He quickly realized that toy train enthusiasts wanted to make their railway layouts as realistic as possible. 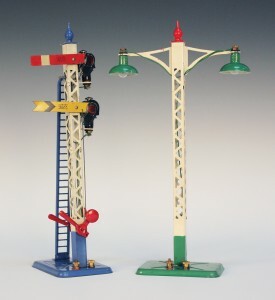 Various accessories were added to production like the station and signalling illustrated here. The Second World War halted production of toys at the ‘Binns Road’ factory in Liverpool with attention turning to war work. They even raised funds for a ‘Meccano’ Spitfire by creating a special pendant to purchase the aircraft. Immediately after the war, the government insisted on Meccano focusing on their export market to help pay off the war debt. The Chichester Lions, Annual Model Miniature Railway Exhibition caters for most model railway enthusiasts with gauges N, OO and O in evidence. Additional family fun is provided by live steam exhibits with rides. Chris enthuses “There are always a diverse range of railway layouts and exhibits on display which are very popular with visitors – it’s always very busy!” Many of the train sets have realistic landscapes and accessories inspired by the earlier production of Hornby. Childhood associations with toys and model trains often seed a lifelong interest, so I’m not surprised that the event should be so popular. It provides the opportunity for us to celebrate an enthusiasm for toys and model railways and support the wonderful work that the Chichester Lions do in our local community. The Chichester Lions, 20th Annual Model Miniature Railway Exhibition is the perfect opportunity to indulge a love of railways. The exhibition is open from 10.00am to 4.30pm on Saturday 25th October 2014 at Chichester High School for Boys, Kingsham Road, Chichester, PO19 8AE. For ticket prices and more information go to www.chilions.org.uk. By Revd. Rupert Toovey. Originally published on 22nd October 2014 in the West Sussex Gazette. I was delighted when the news broke last week that the internationally important ‘Wedgwood Collection’, housed at the Wedgwood Museum in Stoke, had been saved for the nation at a cost of £15.75 million. The final £2.74 million was raised through the Art Fund by public appeal in just a month. The Wedgwood Collection, one of the most important industrial archives in the world, has been saved, thanks to the generosity of thousands of individuals, businesses and a number of grant-making foundations. 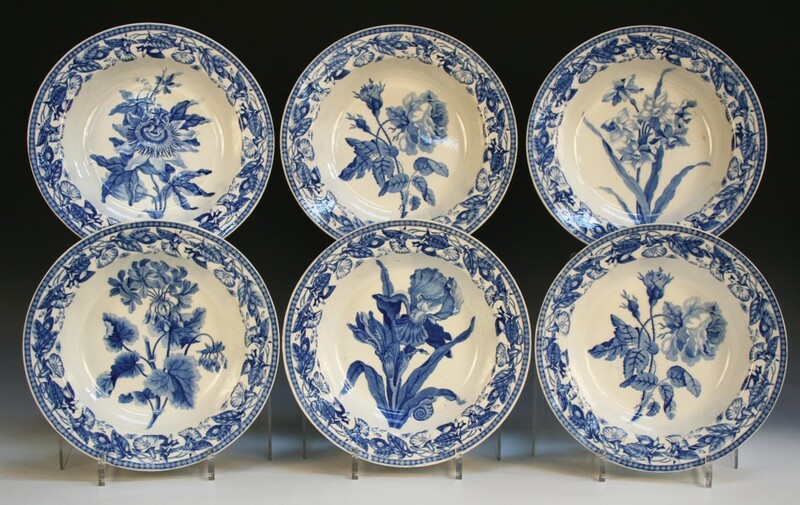 The seeds of the collection were sown by Josiah Wedgwood (1730-95), who in 1774 expressed an aspiration to preserve examples of the objects created by the Wedgwood pottery which bears his name. Josiah Wedgwood’s inventiveness combined his artistic taste and scientific knowledge with a gift for administration and business acumen. He took the manufacture of ceramics to extraordinary heights. These qualities have led many art historians to claim that he was the most distinguished English potter of his age. His reputation was certainly international. Amongst his patrons were the British Royal Family, Catherine the Great of Russia, the Queen of France and the King of Naples. His early appreciation of Neo-Classicism and his eye for young artists with real ability, like John Flaxman and George Stubbs, enabled him to produce ceramics which fitted with this style and decoration. There was an industrial, modern efficiency in the way that he organised his factory and by 1782 he was employing the use of steam power. The simple, elegant patterns of Wedgwood’s cream-coloured earthenware appealed to buyers with a taste for Neo-Classicism. 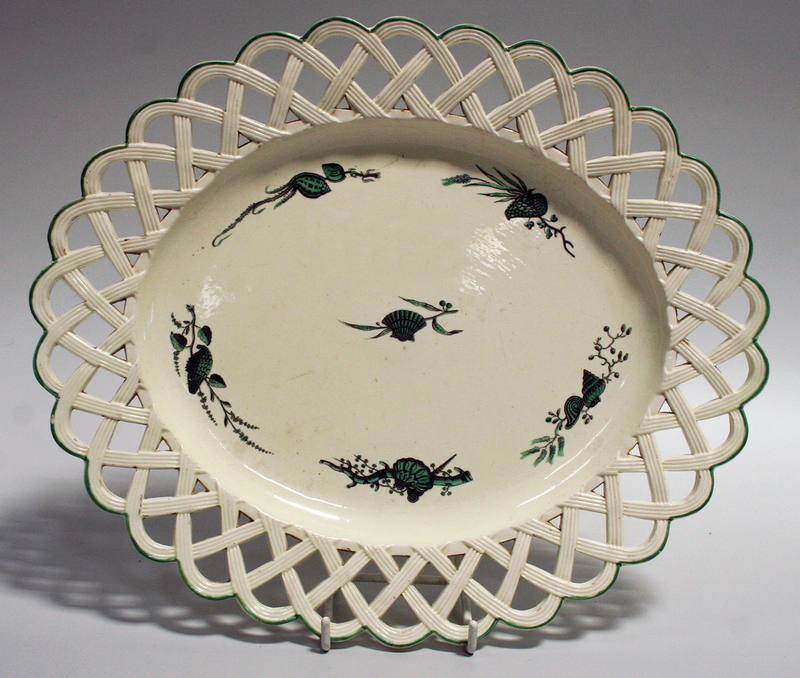 In honour of the factory’s patron, Queen Charlotte, these wares became known as Queen’s Ware. These creamwares were painted, like the late 18th century pierced oval dish illustrated, delicately enamelled with groups of shells and seaweed, or transfer-decorated, like the plates seen here, generously decorated with passion flowers, geranium and iris within borders of convolvulus. The Wedgwood pottery became famous for its vitreous stonewares. The first of these was the red stoneware examples known as ‘rosso antico’. 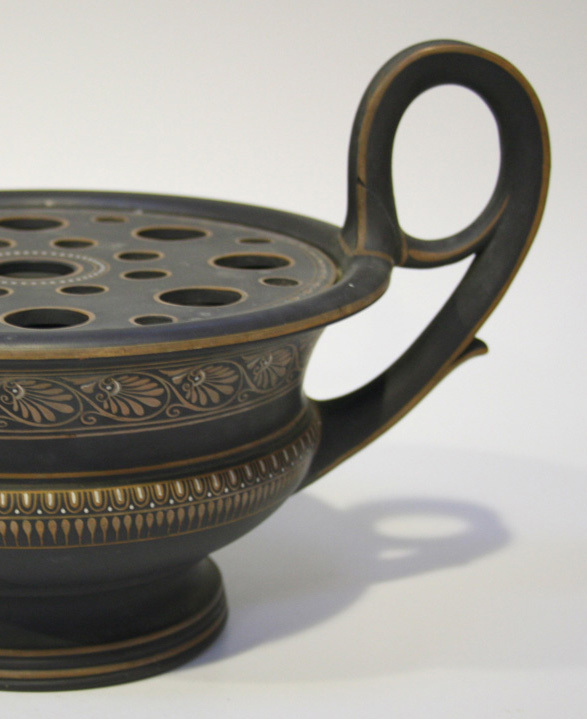 By 1769 the black basalt wares were in production, like the early 19th century black basalt combined bough pot and pastille burner shown here. In this detail you will note the Neo-Classical decorative motif of the band of anthemion sprays. Anthemion is, of course, honeysuckle in the modern vernacular, such a romantic flower. From 1774 Jasper Ware, the most famous of these vitreous wares, was being made. These pieces, with their exquisite forms and white, classical relief decorations against blue, green, lavender or yellow grounds, delight in their bold restraint. The beautiful proportions and forms were often copied from ancient Greek examples of vases, which were defined as Etruscan at that time. Indeed, the Wedgwood factory’s name, Etruria, was taken from this term. 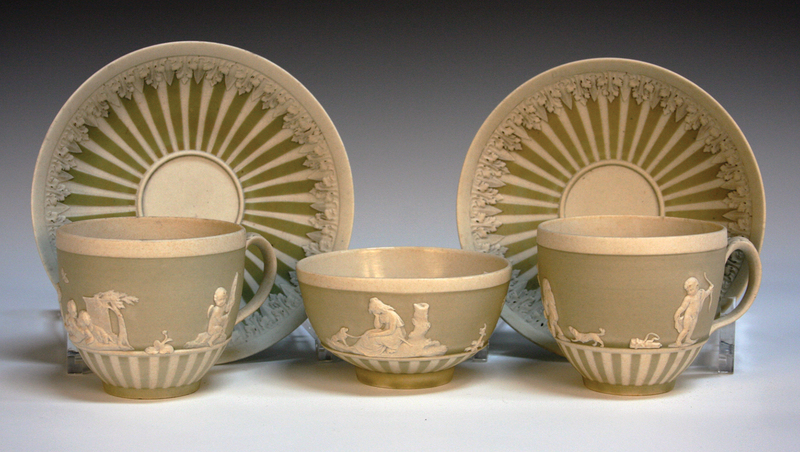 The pair of Wedgwood two-colour jasperware cups and saucers date from the late 18th century. The Wedgwood pale blue jasper dip ‘Pegasus’ vase and cover is later, dating from around 1871. It is ornamented in white with The Apotheosis of Homer, after the artist Flaxman. The square pale blue jasper base is decorated with classical maidens, each canted corner relief decorated with winged mythical beasts. Leading factories such as Meissen, Sèvres and Vienna were amongst Wedgwood’s imitators. Today examples like those illustrated can be bought at auction for between £50 and £2000, whilst the rarest and finest examples realise vastly higher sums. Josiah Wedgwood was a man of liberal and humanitarian views, a supporter of the American Revolution and an advocate for the abolition of slavery. The ‘Wedgwood Collection’ preserves this unique record of British history and global commerce in one place. It contains over 80,000 works of art, ceramics, manuscripts and letters, pattern books and photographs covering the 250-year history of Wedgwood. The Collection will soon be gifted to the V&A and remain on display at the Wedgwood Museum. The ‘Wedgwood Collection’ represents Wedgwood’s extraordinary legacy and position in British industrial and art history. By Revd. Rupert Toovey. Originally published on 15th October 2014 in the West Sussex Gazette. 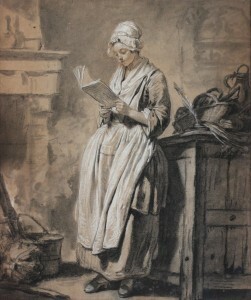 A genre scene picture of a woman standing in an interior reading a book created an electric atmosphere when it was auctioned at Toovey’s for £320,000 on Wednesday 8th October 2014. “It’s an age-old saying in the auction world that you only need two people to create an extraordinary price. £320,000 for an 18th century French School charcoal and chalk drawing is extraordinary by any measure,” said company director Rupert Toovey. This unsigned, unattributed drawing, with little family provenance, was entered by a long-standing Toovey’s client from London, who had inherited it as part of her late mother’s estate. It had lain out of sight in a remover’s store in Southsea for more than fifteen years. The client, who said the drawing was always regarded as an insignificant picture by her family, was amazed and delighted with the result. 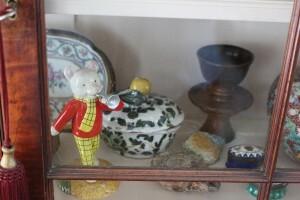 This week, as I have been visiting clients and friends along the foot of the Sussex Downs, I’ve been struck by the rich way that display cabinets and their contents give delight to their owners. Display cabinets have been part of the English home since the 18th century. They provide the collector with the opportunity to display objects to delight the eye and our imaginations. Many of the cabinets you see at auction date from the Edwardian period. They often draw on the classical tastes of the late 18th century. 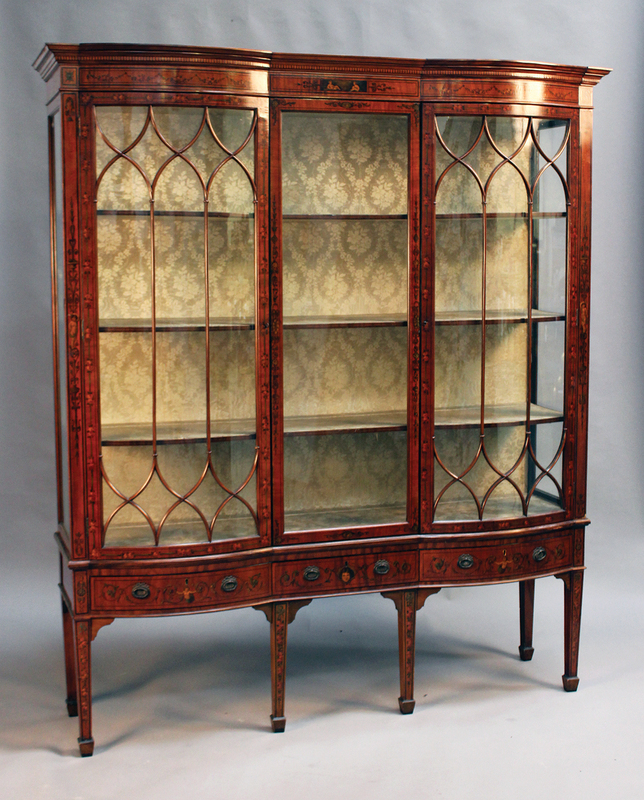 The satinwood example illustrated recently sold at Toovey’s for £2000. It represents the finest craftsmanship and dates from around 1910. Painted with a scheme of rose and ribbon pendants, putti and scrolls, it is both beautiful and practical. Not all display cabinets from the Edwardian period draw on the inspiration of the past. 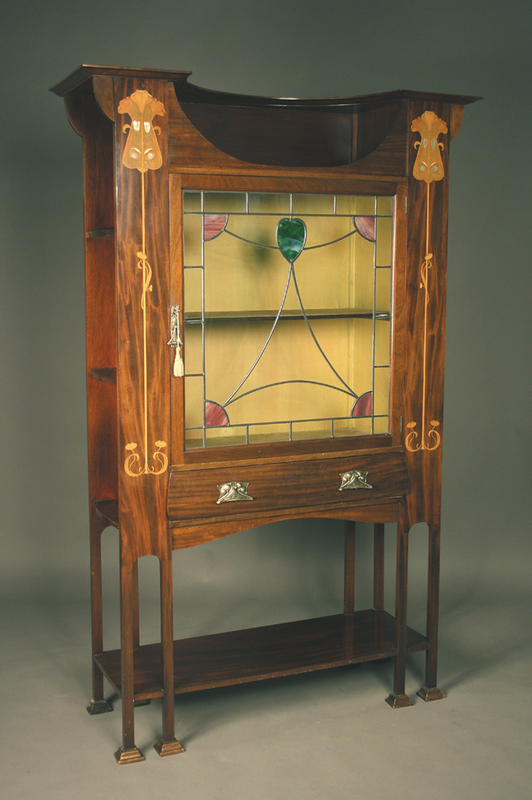 Take, for example, this Art Nouveau mahogany display cabinet, which would almost certainly have been sold by the famous Liberty & Co in London. There is such confidence in its design. The flared canopy and central open shelf seem to allude to an earlier age of English vernacular furniture, and yet this piece embraces the fashion for the Art Nouveau in an uncompromising way. This is articulated in its stained glass and leaded panel door and the stylized floral motifs, inlaid in a variety of woods and mother-of-pearl. The block legs and pad feet are typical of the English Art Nouveau. Today at auction, a cabinet of this quality would realise in excess of £1500. The contents of display cabinets reveal much about their owner’s passions and interests. Like a painting, each glazed pane of a display cabinet frames a composition. The light plays on the surface of the glass, especially where it is hand-blown and subtly textured, emphasising the layered three-dimensional qualities of the arranged objects. Colour, light and shade play their part in bringing these still-life vignettes to life. A lively mind may collect a particular field or period. 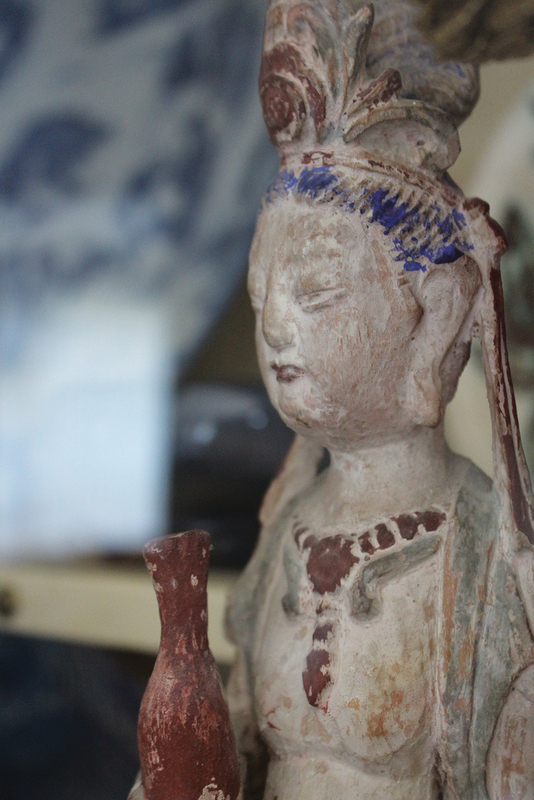 I found this early 18th century Chinese carved wood figure of Guanyin, with its rich blue, ivory and ochre pigment, framed against the gentle tin glaze of a European Delft charger, decorated after the Chinese Transitional taste. Both were nestling undisturbed in a large provincial cabinet. Of course, others will be more eclectic in their tastes. 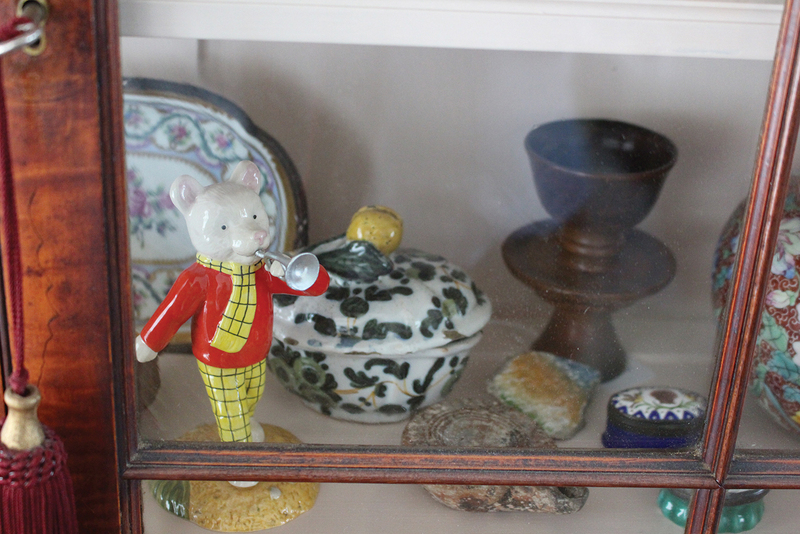 I was delighted to discover Rupert Bear blowing his own trumpet in the company of a small Roman oil lamp, a piece of the Berlin Wall and a treen vessel, framed by the glass of a wonderful satinwood cabinet. The human activity of dwelling, being ‘rooted’, is important to our well-being. Where we live and our material possessions enable us to articulate who we are and ground us not only in the procession of our own lives but also in the broader procession of human history. The display cabinet perfectly encases those things which tell the stories of our lives – prompts to both fond memories and knowledge, representing the patchwork quilt of our lives. Display cabinets and their contents have the power to delight. Perhaps you need one in your life! By Revd. Rupert Toovey. Originally published on 8th October 2014 in the West Sussex Gazette.